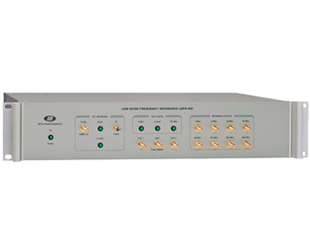 The LNFR-400 is an ultra-low noise frequency reference. The device can be used as a low noise source in phase noise measurement systems. Other applications include high stability frequency synthesizers, reference frequency generation and frequency synthesis chains for atomic standards. 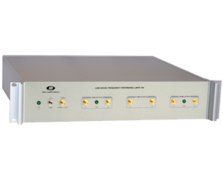 The LNFR-400 contains 5 MHz and 100 MHz ultra-low noise ovenized oscillators. The outputs at 10 MHz, 20 MHz, 40 MHz and 80 MHz are obtained by multiplying the signal from the 5 MHz oscillator. The 100 MHz oscillator is phase locked to the 5 MHz oscillator to provide a lower phase noise signal inside the bandwidth of the phase-locked loop. The output of the 100 MHz oscillator is doubled to obtain 200 MHz and doubled again to obtain 400 MHz. All outputs to the front panel are buffered with low noise isolation amplifiers. 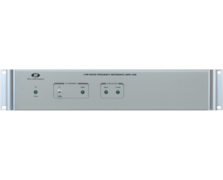 The LNFR-400 can be phase locked via a +/- 5 VDC tuning signal or with a 5 MHz 1 VRMS signal. The synthesizer is offered in a stand-alone rack-mount package. For frequency synthesis chain applications the synthesizer is available in modular form.